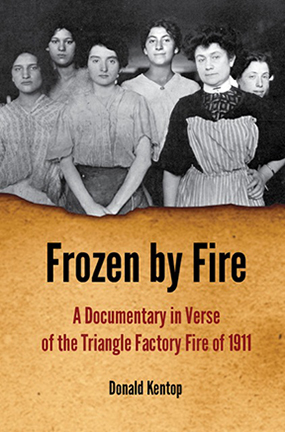 Donald Kentop’s Frozen by Fire: A Documentary in Verse of the Triangle Factory Fire of 1911 describes the blunders, deceits, and machinations that caused the fire and thwarted justice afterwards. 146 people died in the fire that engulfed the eighth, ninth, and tenth floors of New York City’s Asch Building, later renamed the “Brown Building” and used for NYU classes. Most of the 146 dead, and indeed the survivors too, were young immigrant women living in New York City’s slums. Kentop uses his narrative poems, including many dramatic monologues of survivors, to show how tragedy lurks when we view other people merely as means to our own enrichment. It was accepted bad things simply happened. that claimed one hundred workers’ lives a day…. played their hoses on the burning mound. their gallant usher to eternity. Kentop here seamlessly blends journalistic narrative with resonant image. The reader experiences both poignancy and horror. Indeed, many of the collection’s blank verse dramatic monologues reflect humor, pluck, heroism, terror, and bewilderment—often all at once. Kentop captures complex emotion in simple speech. And, indeed, when Kentop lets survivors’ voices relate their stories or a journalistic narrator tell the grim tale, his work is strongest. Years later I returned, I was old by then. asked me why I stood there looking up. I said, once there was a fire here. I told my story, and they went on their way. In Frozen by Fire, Donald Kentop gives voice to Eraclio Montanaro and many other witnesses, survivors, and victims of one of the United States’ worst work place tragedies. Kentop doesn’t want his readers to simply go on their way. He wants them to live with this tragedy in their hearts to help make sure similar tragedies never happen again. Above all, he wants us to respect garment workers and poor laborers generally as distinctive, three-dimensional human beings, not replaceable machine parts or costly liabilities. Indeed, for Kentop, we stand guilty before God if we fail to make mercy as well as money. His fine book—exhaustively researched and expertly designed and featuring over a dozen photographs—is a major contribution to the already rich literature about the 1911 Shirtwaist Factory Fire. Donald Kentop has woven a poetic garment in a solidly structured building the fires of time will not burn away.